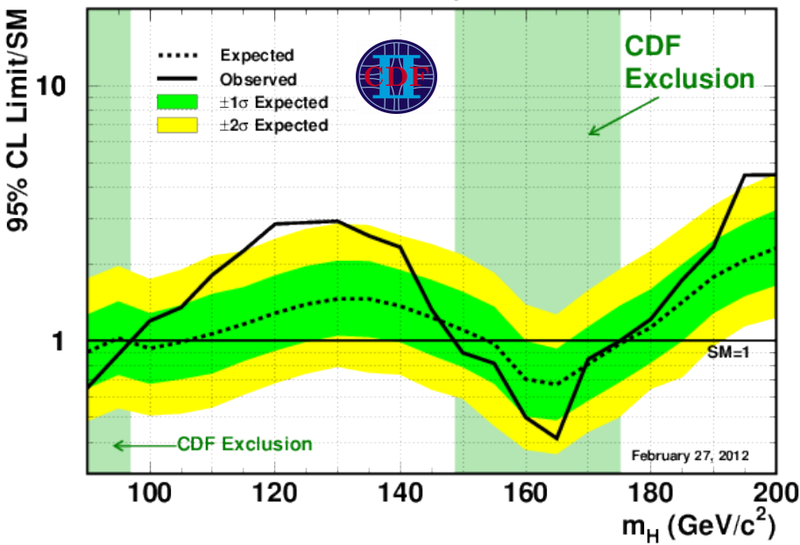 The CDF and D0 experiments have presented new results today that provide a slight improvement on their previous results shown at Moriond in March. 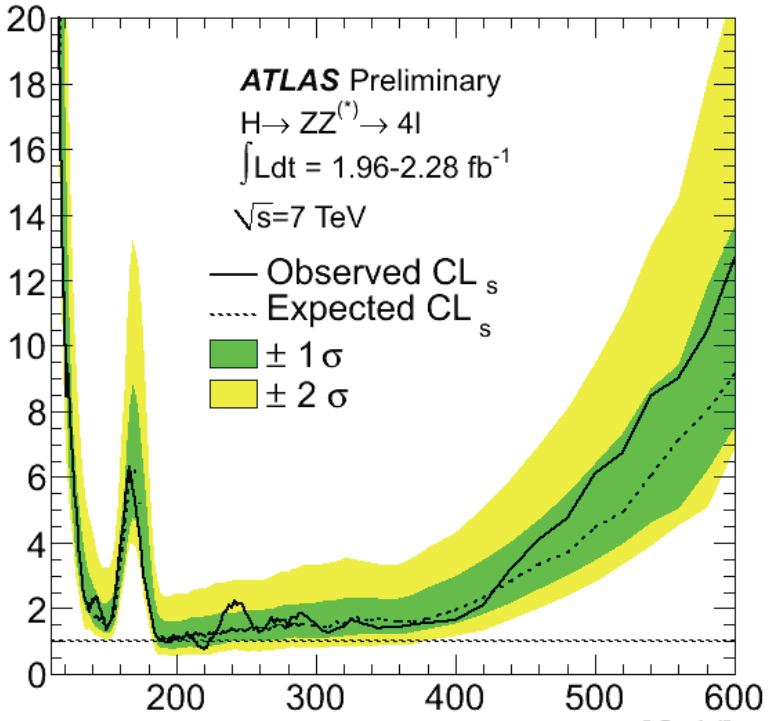 The significance has risen to 2.9 sigma coming mostly from the dominant decay channel to bottom quarks. 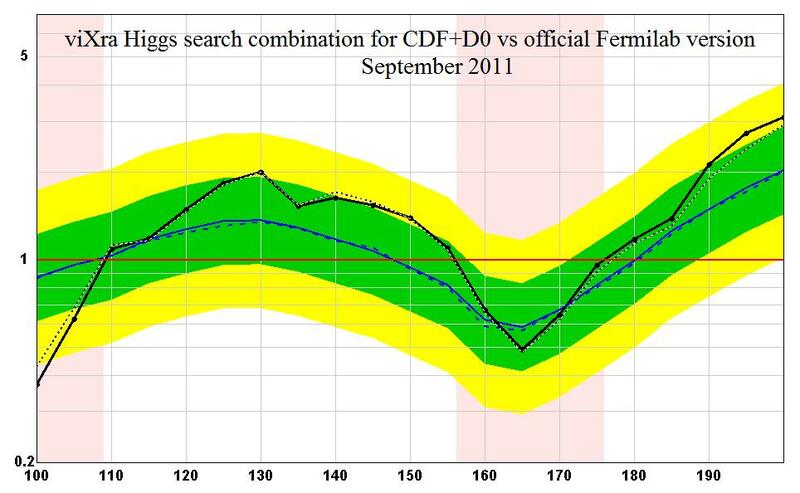 No new data has been added since the Tevatron closed down last year but analysis has continued to look for further decay channels in the data and improve the analysis of the ones already used. 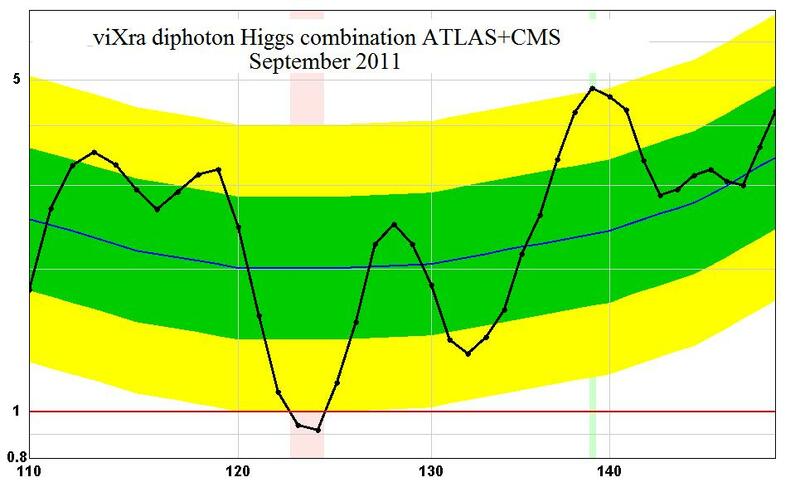 In particular they have improved the analysis of bb decays where the Higgs boson is produced in conjunction with a W or Z vector boson. This is the current state of the combination. They have said that they are not finished yet with the possible improvement by 10% in some areas so we should see further updates. 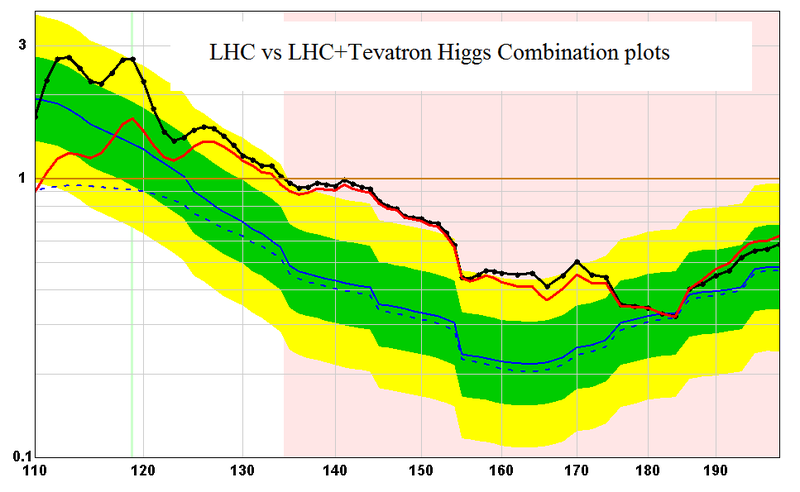 All eyes will now turn to CERN where a much more dramatic update is expected in Wednesday, but the Tevatron results remain important because the LHC is not so sensitive to the bb channel which is important for showing that the Higgs couples correctly to fermions. Interest in the Higgs news is already rocketing with #Higgs and “God Particle” both trending on Twitter while over 1250 viewers are watching the live stream from the Tevatron. 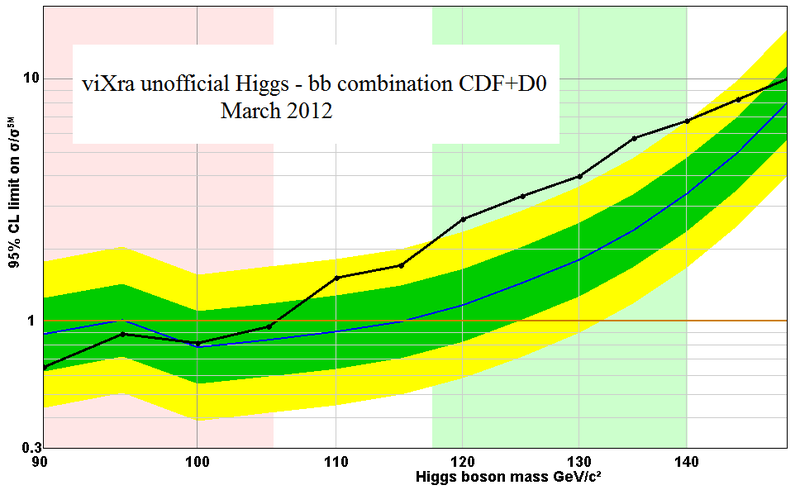 Update: Here is the latest version of the unofficial global Higgs combination with the new results from D0 included. 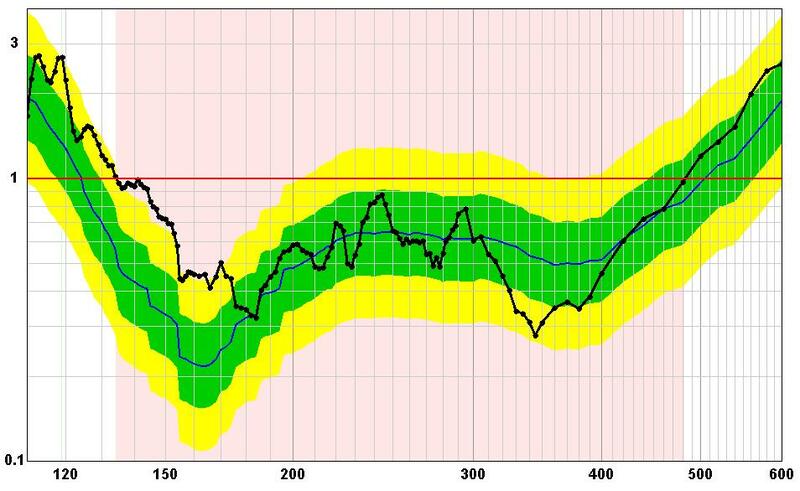 The significance at 125.5 GeV has crept up to 4.4 sigma. Later I will give a new combination with the LHC results which may also be updated today, but for now here is a useful variation on the plot showing it as a Signal curve. 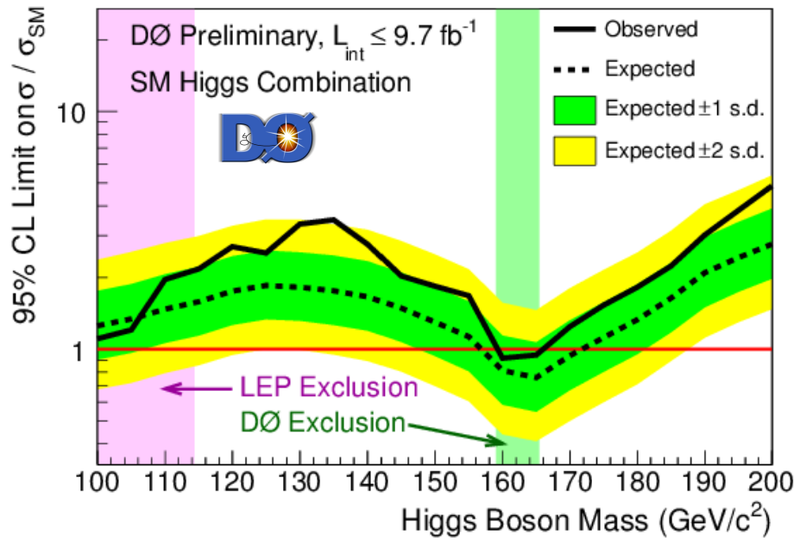 In this plot the zero line represents no Higgs boson while the line at one is expected for the standard model Higgs boson. 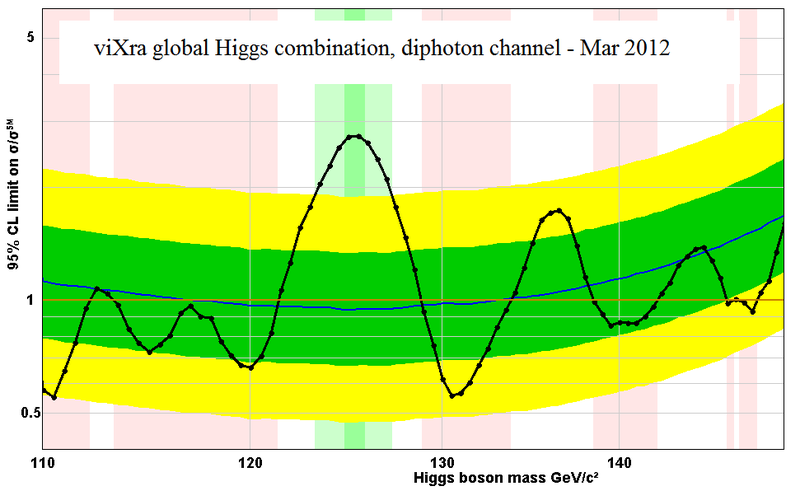 What we see is a signal perfectly consistent with a boson in the mass region of about 115 GeV to 140 GeV. 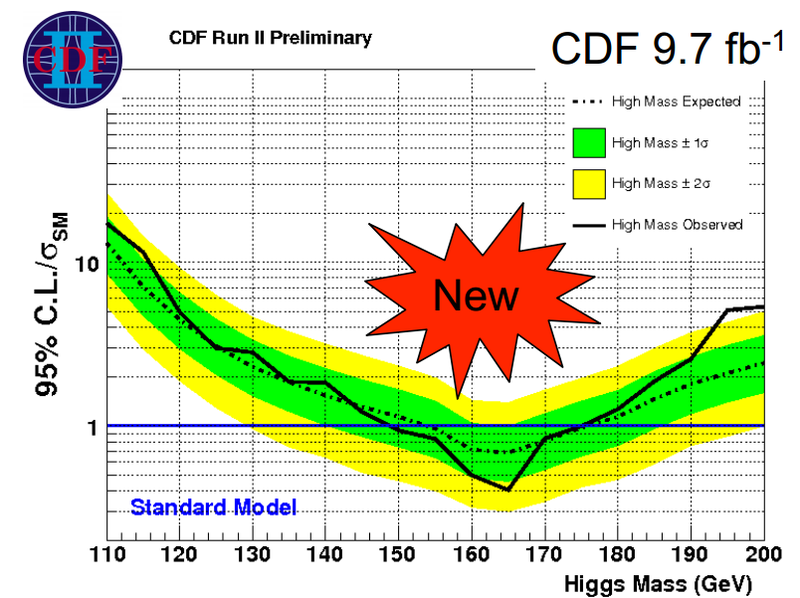 The mass resolution is not as good as the LHC results and the significance of the excess is less but consistency with the other results is what we were hoping for, so well done to CDF and D0 for this nice final Higgs result from them. 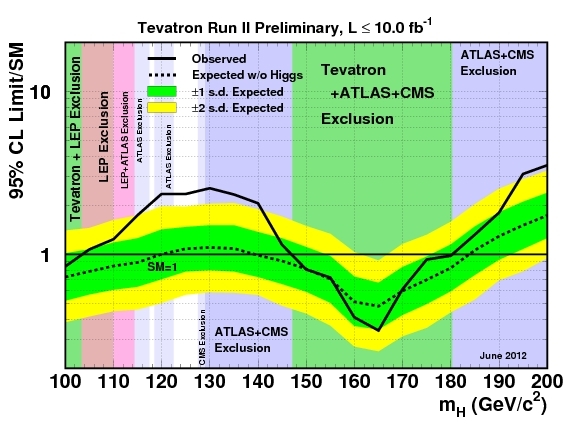 Update: Here is the combination of the new Tevatron data with the latest ATLAS and CMS. 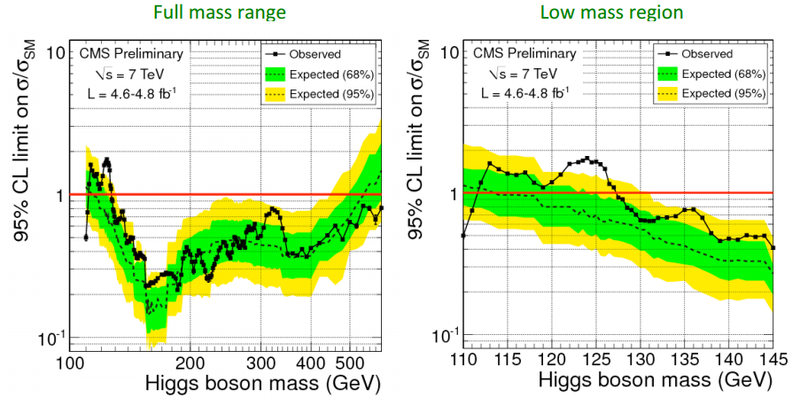 On the left is just ATLAS+CMS on their own, and on the right the Tevatron is included. (Remember these are just my unofficial approximate combinations) The result is a small improvement in the overall level of the peak excess. Today at La Thuile physicists from the Tevatron and LHC have been giving out a few teasers in preperation for the next Higgs updates expected at Moriond. This is a companion to the equivalent plot from CDF published a month ago. At the LHC this is the most exciting channel but at the Tevatron it does not reach the sensitivity required to tell us anything about a standard model Higgs. 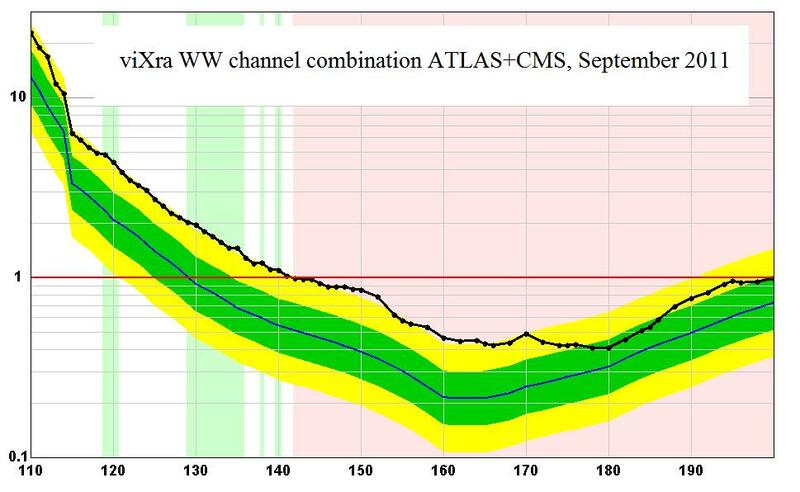 Slightly more interesting is this WW channel plot from CDF which improves on previous limits by about 10% (Richard StDenis). This is close to the sensitivity where some excess could have emerged but nothing is apparent. 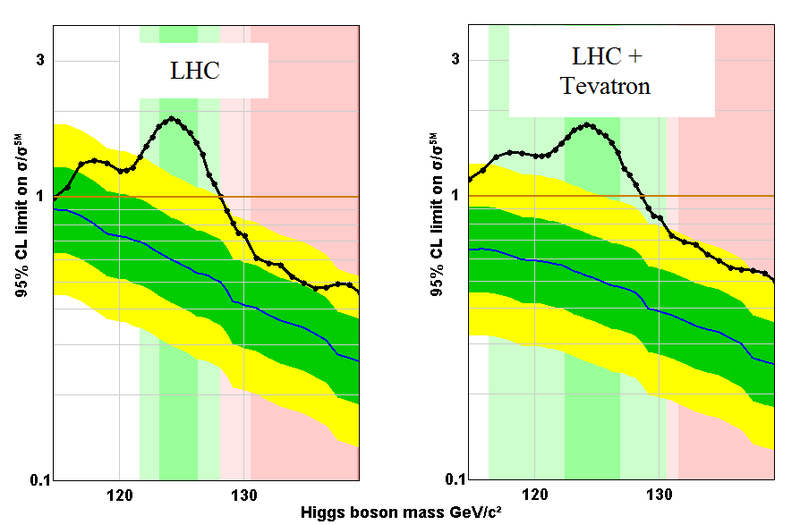 The real interest for the Tevatron is the Higgs decay to two bottom quarks (bb channel) . For that and the combinations we are told to wait until next week which probably means Moriond. ATLAS and CMS have not provided any new plots yet but ATLAS have reminded us that they still have to update WW, bb and ττ at 5/fb and we are also told to expect news at Moriond from them. 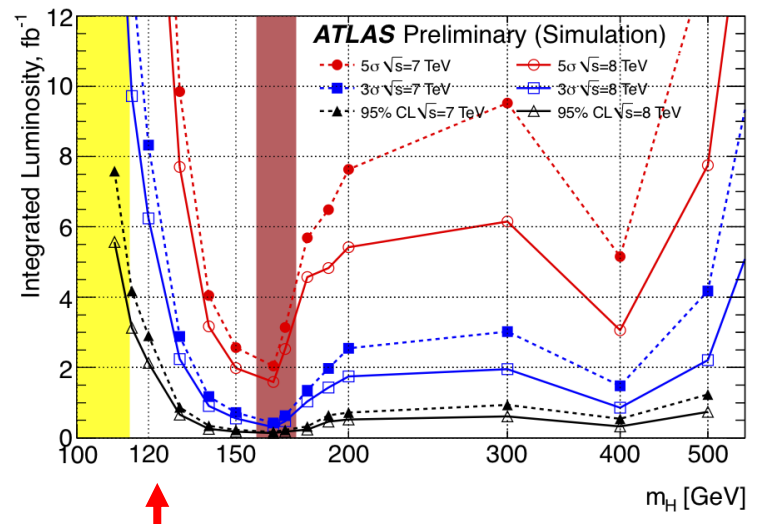 The ATLAS+CMS combinations previously expected for Moriond have apparently been abandoned. With the peak excesses from the two experiments in slightly different places the benefit of doing the combination may not justify the resources needed to produce it. Instead they look set to aim for independent discoveries from both ATLAS and CMS by the end of the year. 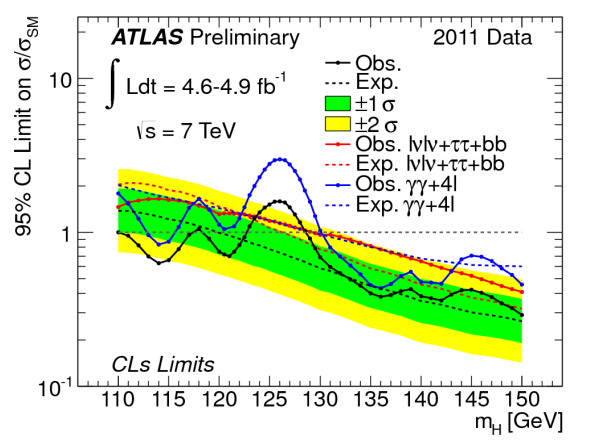 This will not be an easy task as this plot at the bottom of the ATLAS talk shows (Junichi Tanaka) The 8 TeV energy improves the cross section by 30% and 3 sigma sensitivity is within easy reach with 2012 data, perhaps even in time for ICHEP, but 5 sigma discovery quality results require the full years run and some good luck. A run extension and a combination with 2011 data may be needed to polish it off. The same goes for CMS of course, and there is always the possibility that they will end the year with one team having better luck than the other. 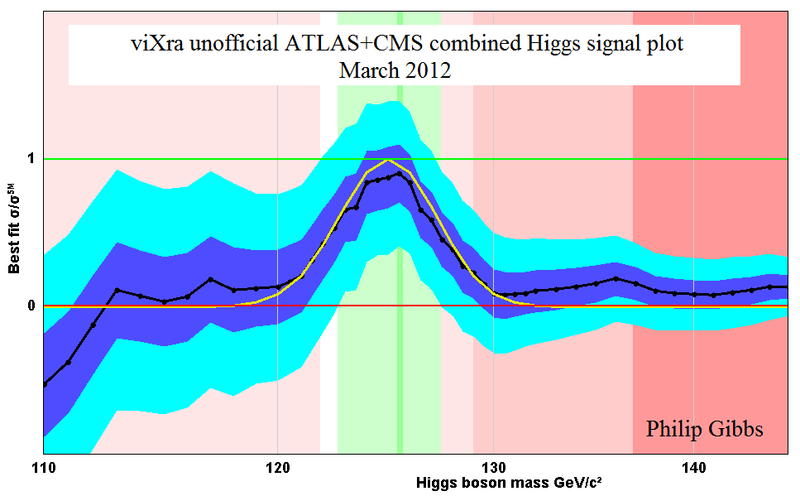 CMS also presented today (Josh Bendavid) but they have already given us everything they have for Higgs in 2011 data. 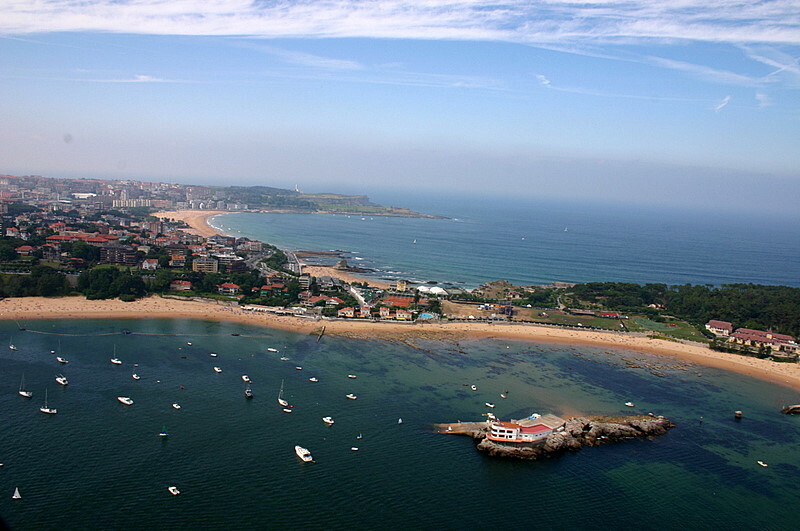 Santander is a Spanish port on the Bay of Biscay coast that next week will host its fourth annual workshop on the Higgs Boson. This meeting will be very different in character from the huge summer conferences where exciting new results on searches for the Higgs boson were recently presented to thousands of physicists. The Santander meeting involves just 30 participants with a mix of theorists and experimenters involved in the analysis of data from Fermilab and CERN. Half their time will be spent presenting slides and the other half will be discussions covering searches for standard model Higgs and other models including the charged Higgs sector of SUSY. 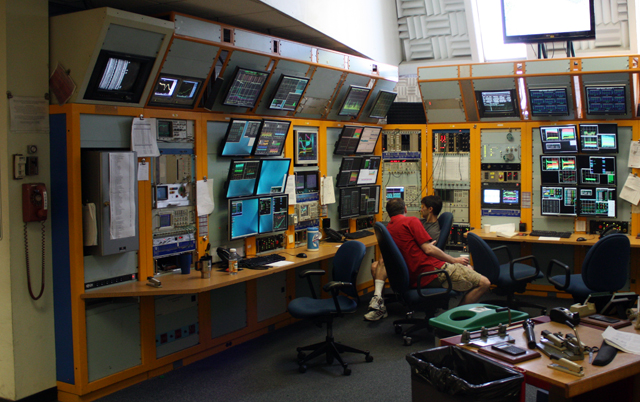 They will talk about the procedures for combining Higgs searches across experiments and implications of any findings. The aim is to promote a dialog between theorists and experimenters about what data needs to be shared and how. There is no indication that the discussions will be webcast or recorded for public viewing and it is not sure that all the slides will appear online so as outsiders the rest of us may have very little indication of what they decide. It is unlikely that new data will be made public but there is some chance that we may finally get to see a combination of ATLAS and CMS search data. Originally we were promised a combination of the searches shown at EPS in July using the first 1/fb of data from the LHC. Instead we got a new helping of plots from the individual experiments using 1.6/fb in the most important channels and even 2.3/fb for the ZZ channel in ATLAS. These were shown at the Lepton-photon conference in August. Theorists would now very much like to see the combinations of these data sets and it is not clear why they have been held back. One question has become very topical and has already surfaced at some of the larger Higgs workshops: Is it right to do quick approximate combinations of Higgs search data or do we need to wait for the lengthy process of producing the official combinations? This summer I have become quite notorious for doing these quick combinations and showing them on viXra log. These have variously been described by experts as “nonsense” (Bill Murray) “garbage” (John Ellis) and “wrong” (Eilam Gross), but just how bad are they? Here is a plot of my handcrafted combination of the D0 and CDF exclusion plots compared with the official combo. 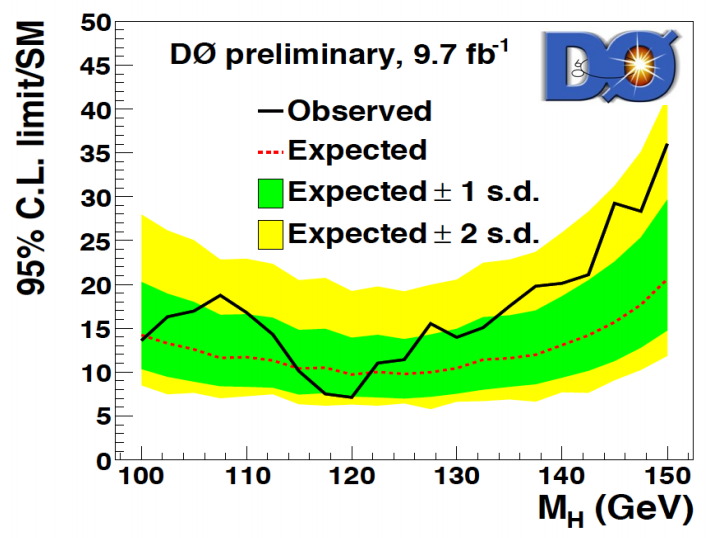 The thick black line is my version of the observed exclusion limit that can be compared with the dotted line of the official result, while the solid blue line is may calculated expected limit to be compared with the official dashed line. You need to click on the image for a better view. My result is not perfect but I hope you will agree that it provides similar information and you would not be misled into drawing any wrong conclusions from it that were not in the official plot. Any discrepancy is certainly much smaller than the statistical variations indicated by the green and yellow bands for one and two sigma variations. A more ambitious project is to combine exclusion plots for individual channels to reproduce the official results for each experiments. 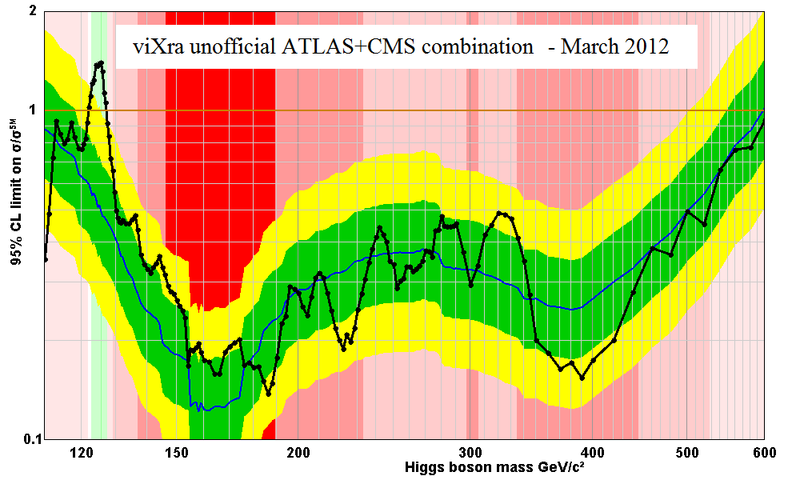 Here is my best attempt for the latest ATLAS results where I have combined all eight channels for primary decay products of the Higgs boson. As you can see it is very hard to follow the lines on this plot, especially the dashed expected limit line. I don’t want to be over-critical but seriously guys, can’t you do better than this? Another source of error comes from neglect of correlations between the individual plots where background estimates may have the same or related systematic errors. The Higgs combination group at CERN play on this as one of the reasons why these quick combinations can’t be right, but I doubt that these effects are significant at all. 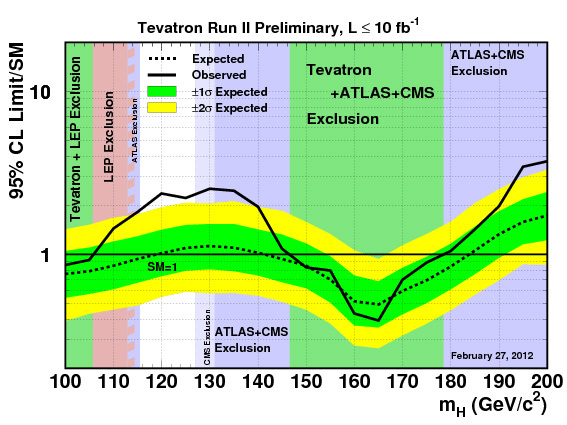 If they were I would not be getting such good results for the Tevatron combination. For example, if one experiment tells me that the mass of the proton is 938.41 ± 0.21 GeV and another tells me it is 938.22 ± 0.09 GeV and I know that the errors and independent, then I can combine with the above formula to get a value of 938.25 ± 0.08 GeV. The Particle Data Group does this kind of thing all the time. The black line (value of ) is the observed combined signal for the Higgs boson normalised to a scale where no Higgs boson is zero and a standard model Higgs boson gives one. The blue and cyan bands show the one and two sigma statistical uncertainty ( and ). Don’t think about where the Higgs boson is for now. 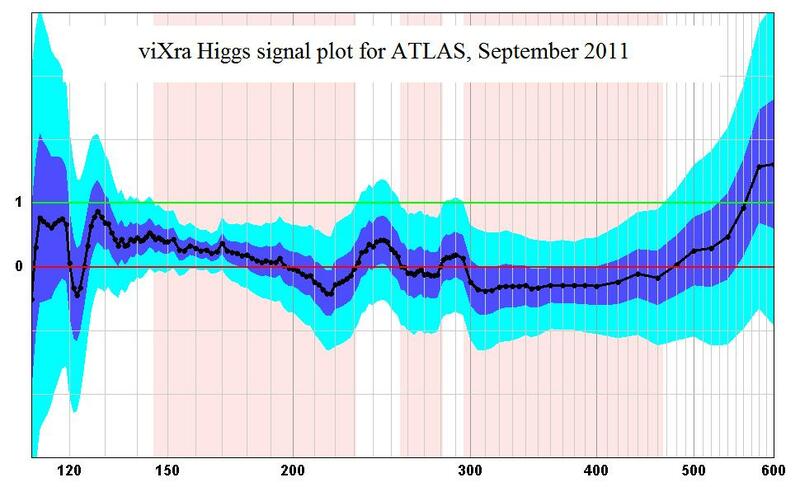 Just look at the upper two sigma level curve and compare it with the ATLAS Higgs exclusion plot above (i.e the dotted line, click to enlarge for a better view). These are of course the same lines because the 95% level exclusion is given when the 2 sigma error is below the signal for SM Higgs. The expected line on the exclusion plot is just where the observed line would be if the signal were evrywhere zero, i.e it is a plot of . In summary, the observed limit for in the exclusion plot is just and the expected limit is just . We can derive one plot from the other using this simple transformation. From this it should be clear how to combine the exclusion plots. We first transform them all to signal plots, then they can be combined as if they are normal distributions. Finally the combined signal plot can be transformed back to give the combined exclusion plot. This is what I did for the viXra combinations above. Ignoring the digitisation errors and the unknown correlations, the largest source of error is the assumption that the distribution is normal. In reality a log normal distribution or a Poisson distribution would be better, but these require more information. Fortunately the central limit theorem tells us that anything will approximate a normal distribution when high enough statistics are available so the combination method gets better as more events accumulate. That is why the viXra combination of the exclusion plots for each experiment is more successful than for the combination of individual channels. The number of events seen in some of these channels is very low and the flat normal distribution is not a great approximation to use. As more data is collected the result will get better. Of course we cannot expect a reliable signal to emerge from individual channels until the statistics are good, so it could be argued that the approximation is covered by the statistical fluctuations anyway. 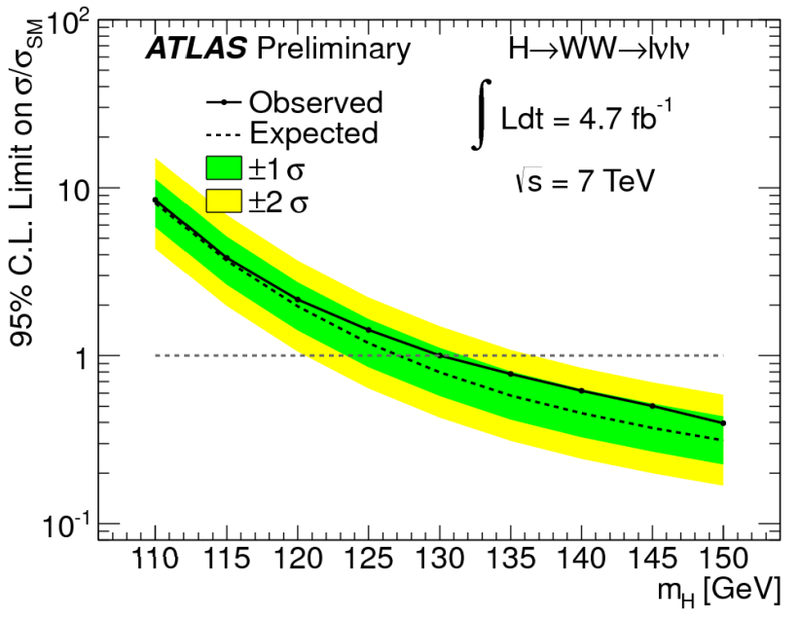 I don’t know if a full LHC combination will emerge next week at the Santander workshop but in case it does, here is my best prediction from the most recent data for comparison with anything they might show. Some people say that there is no point producing these plots because the official versions will be ready soon enough, but they are missing the point. 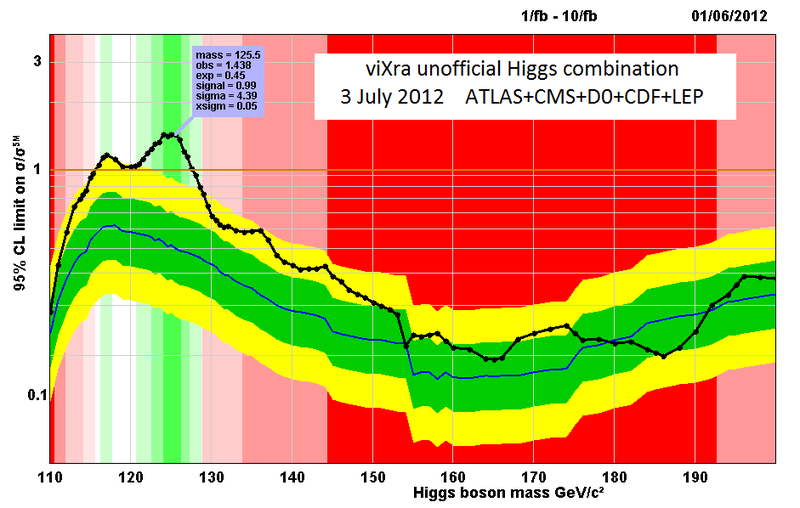 The LHC will produce vasts amounts of data over its lifespan and these Higgs plots are just the beginning. The experimenters are pretty good at doing the statistics and comparing with some basic models provided by the theorists, but this is just a tiny part of what theorists want to do. The LHC demands a much more sophisticated relationship between experimenter and theorists than any previous experiment and it will be necessary to provide data in numerical forms that the theorists can use to investigate a much wider range of possible models. As a crude example of what I mean, just look at the plot above. It provides conflicting evidence for a Higgs boson signal. 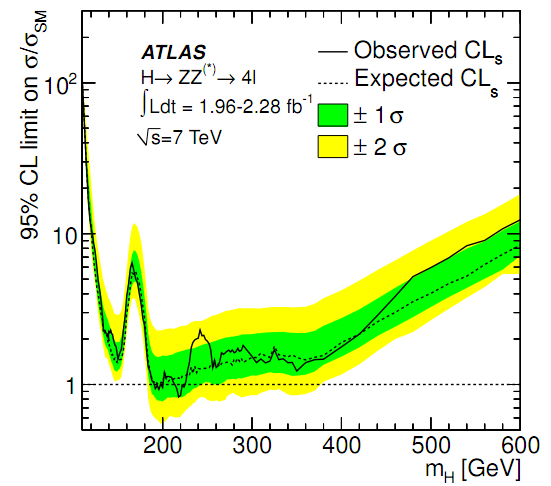 At 140 GeV there is an interesting excess but it is below the exclusion limit line. 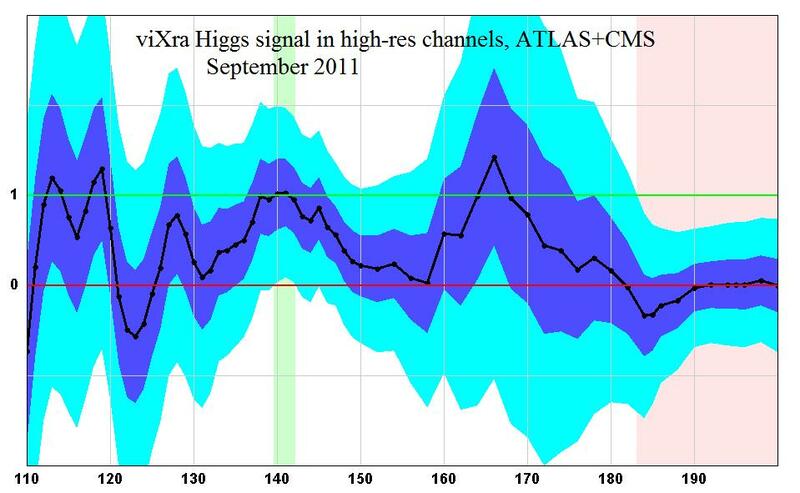 Is this a hint of a Higgs signal or not? To answer this I might look at different channels combined over the experiments. Here is the ZZ channel combined over ATLAS and CMS. 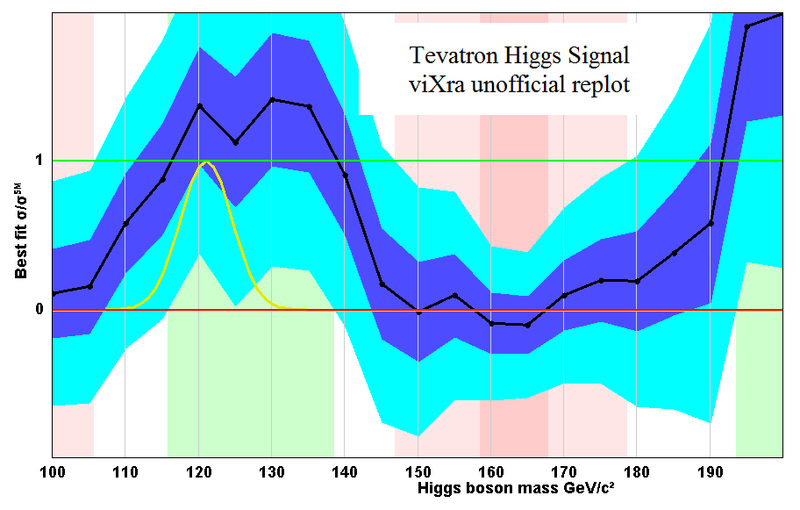 The Higgs hint at 140 GeV is now nice and clear, though not significant enough yet for a reliable conclusion. Here is the diphoton channel combination. Again the 140 GeV signal is looking good. What about the WW channel? Here is where the problem lies. 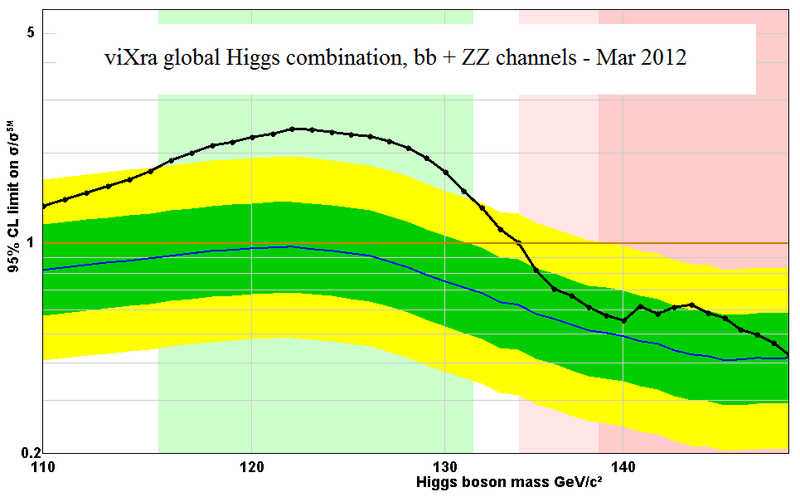 The WW channel has a broad excess from 120 GeV to 170 GeV at 2 sigma significance, but it is excluded from about 150 GeV . In fact the energy resolution in the WW channel is not very good because it relies on missing energy calculations to reconstruct the neutrino component of the mass estimation. Perhaps it would be better to combine just the diphoton and ZZ channels that have better resolution. I can show the result in the form of a signal plot. It’s still inconclusive, but at least it is not contradictory. This is just as example of why it will be useful for theorists to be able to explore the data themselves. The signal for the Higgs will eventually be studied in detail by the experiments, but what about other models? There is a limit to how many plots the experiments can show. To really explore the data that the LHC will produce theorists will need to be able to plug data into their own programs and compare it with their own models. 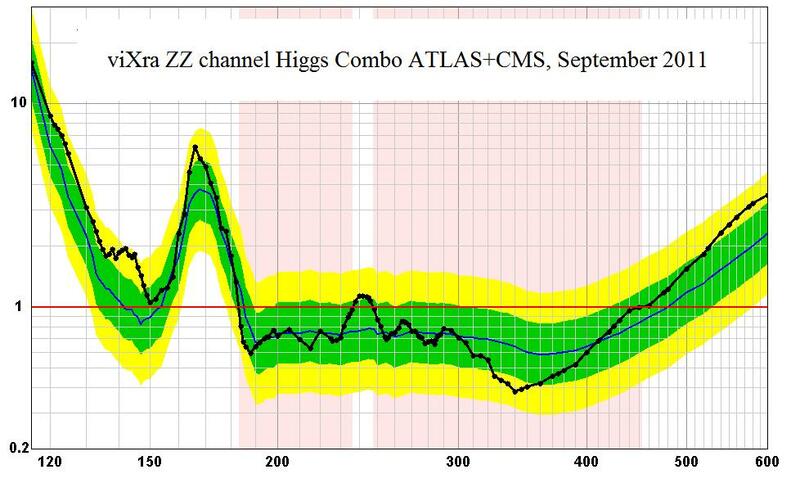 The precise combinations produced by the Higgs combination groups take hundreds of thousands of CPU hours to build and are fraught with convergence issues. My combinations are done in milliseconds and gives a result that is just as useful. There is no reason why the experiments can’t provide cross-section data in numerical form for a wide range of channels with better approximations than flat normal distributions if necessary. This would allow accurate combinations to be generated for an infinite range of models with varying particle spectra and branching ratios. It will be essential that any physicist has the possibility to do this. I hope that this is what the theorists will be telling the experiments at Santander next week and that the experiments will be listening. 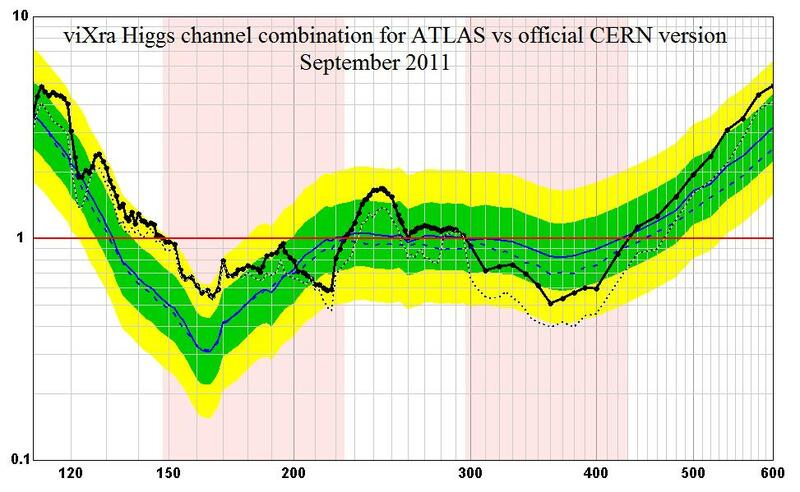 Update 26 Sept 2011: I found a better version of the ATLAS ZZ -> 4l plot that I was moaning about. It has not appeared in the conference notes for some reason but it is same data from LP11 so I think it must be OK to show. The latest expectation from the combination group is that a Lepton-Photon based combo will be ready for Hadron Collider Physics 2011 which is in Paris starting 14th November. 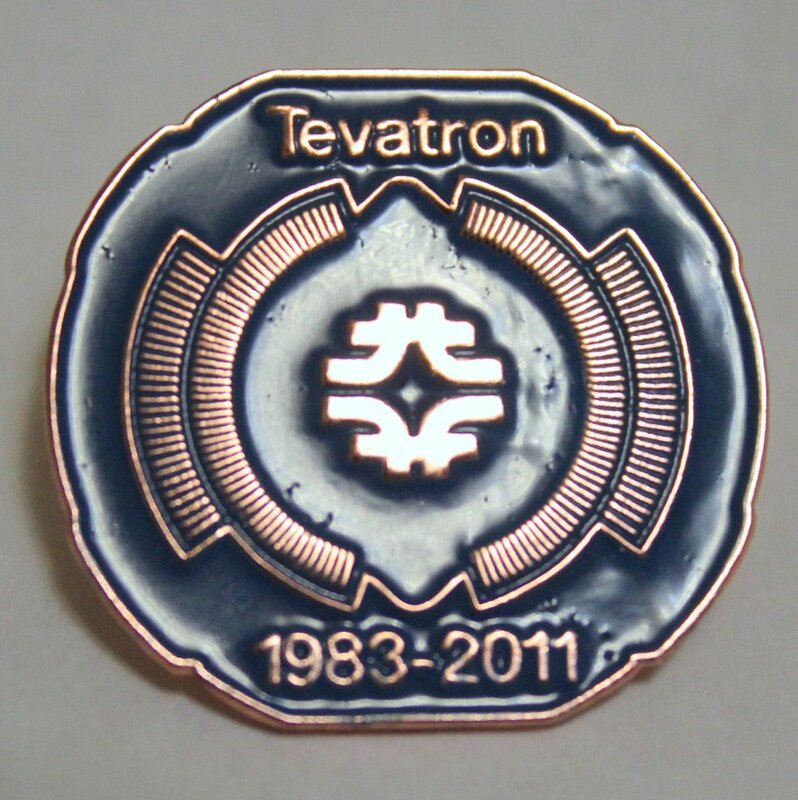 You are currently browsing the archives for the Tevatron category.